Spring is the quintessential season for cleaning, so it makes sense that we also plan a lot of our maintenance tasks for this season as well. While you’re planning your cleaning and maintenance projects, put the HVAC system at the top of the list. 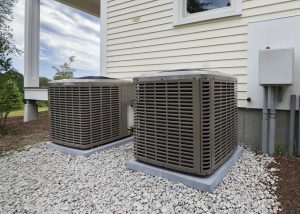 Getting this stuff out of the way early will ensure that your HVAC system is ready to tackle the pollen and air quality issues of spring and the summer heat that follows. Here are three important HVAC maintenance tasks you should get to early this spring. You should have a technician come in twice a year to perform preventative maintenance and any needed repairs. Spring and fall are the most common times for this service. While they are inspecting the HVAC unit, ask them to also inspect the ducts for dust accumulation and airtightness. Most ducts need to have the dust cleaned out once every five to seven years. This helps to improve indoor air quality and keep your system running smoothly. While they are checking for dust, the technician can also check that all the ducts are airtight. When they’re not, you lose conditioned air into areas of your home or business that don’t need it (like behind the walls). Sealing the ducts against leakage can improve the efficiency of your HVAC system tremendously. Air filters are the key to good indoor air quality. Dirty filters can’t adequately clean the air, and they also put unnecessary strain on the HVAC system and decrease performance. Air filters need to be inspected every month and replaced every 30-90 days or so, depending on the intensity of use. If you haven’t been checking on your filters, now is the time to do that, and if it has been more than 3 months since you changed the filter, you need to do it now. Filters need to be changed a minimum of every 3 months. This is also an ideal time to check the area around your outside unit. Plants often grow up and trash and debris can accumulate around the unit and cause problems. You should make sure you have 2 feet of clearance around your unit, and periodically check to make sure nothing is building up or growing up around it. This entry was posted on Friday, March 29th, 2019 at 9:44 pm. You can follow any responses to this entry through the RSS 2.0 feed. You can leave a response, or trackback from your own site.